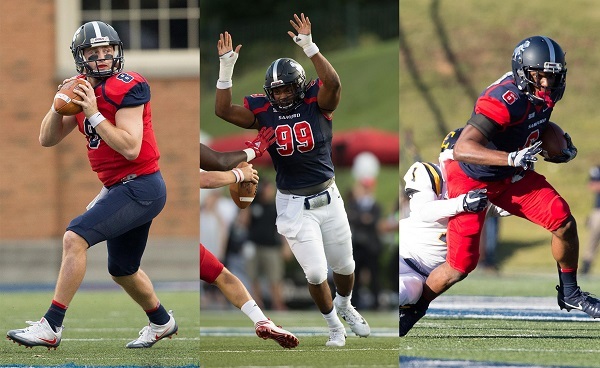 Three members of the Samford University football team were named to the STATS preseason All-America teams. Quarterback Devlin Hodges and defensive lineman Ahmad Gooden were named to the first team. Wide receiver Kelvin McKnight earned second-team honors. Hodges, the two-time SoCon Offensive Player of the Year, passed for 3,983 yards and 31 touchdowns. He completed 65.7 percent of his passes (347-of-528) and averaged 331.9 passing yards per game. Hodges led the Southern Conference and ranked in the top 10 nationally in passing yards per game, total offense per game and total offensive plays. Hodges came in fourth in the voting for the Walter Payton Award, given to the FCS' top offensive player. Gooden, who was named the SoCon's Defensive Player of the Year, ranked second on the team and sixth in the Southern Conference in total tackles with 101. He also led the team and ranked second in the SoCon in tackles for loss with 15.5, and he tied for fourth in the league in sacks with 5.5. Gooden finished seventh in the voting for the Buck Buchanan Award, which goes to the top defensive player in all of FCS football. McKnight led the SoCon in receptions per game (7.8), receiving yards per game (107.2), total receptions (86) and total receiving yards (1,179) last season. He tallied at least 100 receiving yards in six games last season, and he had at least one touchdown in eight contests in 2017. Samford returns 10 starters on offense and six starters on defense from a team that went 8-4 overall and 6-2 in Southern Conference play last season. The Bulldogs have reached the NCAA Division I-FCS Playoffs in back-to-back seasons for the first time since the 1991 and 1992 seasons. Samford will open the 2018 season by hosting Shorter on Thursday, Aug. 30, at Seibert Stadium, with the kickoff time set for 6:30 p.m.